'America's Battalion' In Afghanistan The Marines of the 2nd Battalion, 8th Regiment — known as "America's Battalion" — were deployed in Afghanistan from May to November 2009 as part of a surge of 21,000 troops ordered up by President Obama early in his term. 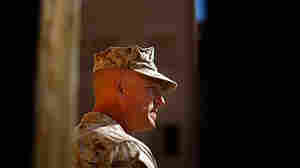 NPR followed the Marines, and their families, during the deployment. November 23, 2009  It's one thing to be a Marine wife, and yet another when you are the wife of the commanding officer — and the other wives are looking to you for guidance. 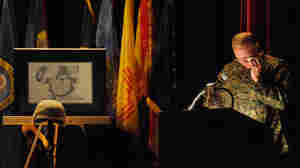 Stephanie Cabaniss's husband is commanding a battalion in Afghanistan. She discusses the stress and strains of being the highest-ranking spouse. January 14, 2011  U.S. Marine Lance Cpl. 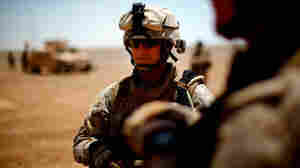 Josh Apsey, 20, is preparing to return to Afghanistan's volatile Helmand province for his second deployment. Much will be different this time -- he will be one of the more experienced members of his battalion, and he will be leaving a new family member behind: his wife. March 29, 2010  Sgt. Maj. Robert Breeden has been deployed 13 times, but his recent stint in Afghanistan was different. The fighting was intense, and his battalion lost 14 Marines. Now the 2nd Battalion, 8th Regiment is back home, and as Breeden settles into post-combat life, he finds his biggest fight is against boredom. December 5, 2009  Just two weeks after the the 2nd Battalion, 8th Regiment — known as "America's Battalion" — returned home from Afghanistan, family and friends joined them at Camp Lejeune, N.C., to honor 13 members who will never return. November 20, 2009  When the Marines of "America's Battalion" first arrived in Afghanistan, they were eager to get into the fight against the Taliban. Now, as they wrap up their seven-month deployment — and after the loss of a dozen comrades — they see warfare in a different light. November 17, 2009  Marines from "America's Battalion," the 2/8, are returning home this month from Afghanistan after a six-month deployment. But before they go, they are passing along vital knowledge of the enemy and the terrain of Helmand province to the Marines replacing them. 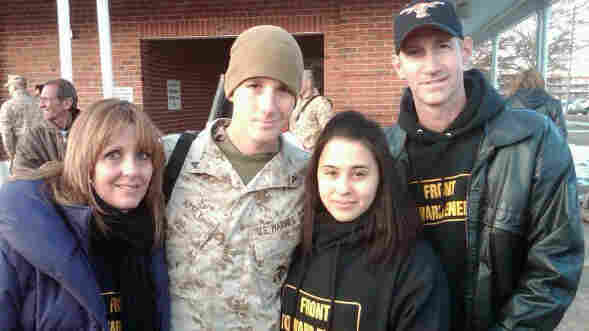 November 12, 2009  Shortly after Marine Sgt. Thomas Joiner left for Afghanistan, his wife, Charmaine, couldn't make ends meet. Their five kids are worried he won't come back — and now the only boy, who is 8, is acting out. "I just can't wait to see his face again," Charmaine says. "And to feel him and touch him and to know he's really just standing there." November 3, 2009  The Marines in Afghanistan's Helmand province are pursuing a counterinsurgency strategy of "hold to build" — pushing out the Taliban and helping the Afghan government bring a sense of normalcy to villages in a region known as the "snake's head." October 27, 2009  The Marines of "America's Battalion" have been fighting the Taliban in southern Afghanistan's Helmand province since July. Now, as the Marines move south, looking to extend their area of operation, they are patrolling for the deadliest of threats: roadside bombs. September 15, 2009  Lance Cpl. Josh Apsey is serving in southern Afghanistan with the Marines of the 2nd Battalion, 8th Regiment — known as "America's Battalion." Back home, his parents wait for any word from him. They must rely on old-fashioned letters and the occasional phone call to stay in touch. September 3, 2009  The Marines provide an official network of support on base for the wives and families of Marines in combat, but the Marine Corps does not staff a support person for the parents. Volunteers fill in the gap. 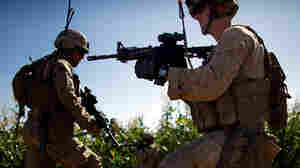 NPR has been following the 2/8 during its challenging deployment to southern Afghanistan. August 19, 2009  Marines fighting the Taliban in Afghanistan's Helmand province face another foe, too: the strain of separation from loved ones that sometimes leads to heartbreak and divorce. Phone calls home are rare, and letters can sometimes take weeks. Officers and chaplains seek to counsel and comfort the Marines. August 12, 2009  Lt. Col. Christian Cabaniss, commanding officer of the 2nd Battalion of the 8th Marine Regiment out of Camp Lejeune, N.C., talks with Melissa Block about his unit's deployment in Helmand province, Afghanistan. He says the terrain is the most difficult the Marines have faced since World War II. July 21, 2009  When Marines with the 2nd Battalion, 8th Regiment received orders that they were going to Afghanistan, they knew conditions would be austere. What the families are discovering is that a few simple household items can keep their Marines safe and clean while fighting on the front. July 13, 2009  About 4,000 U.S. Marines in southern Afghanistan are engaged in the largest American military operation in years: rooting out the Taliban in Helmand province. Two NPR journalists who spent time with Marines share two distinctly different stories of how the offensive is unfolding. July 13, 2009  Family and friends held a funeral in Adairsville, Ga., for Lance Cpl. Charles Seth Sharp. 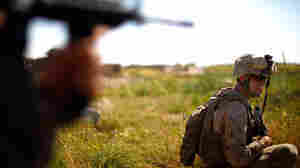 He was the first Marine killed in the start of a major operation in Afghanistan's Helmand province. He had served previously in Iraq. July 13, 2009  U.S. Marines newly deployed in the southern part of Afghanistan are under increasing attack by the Taliban. They are using hit and run guerrilla tactics as the American troops are trying to stabilize the region in preparation for next month's elections. July 9, 2009  The Marines of the 2nd Battalion, 8th Regiment's Fox Company are part of a massive military offensive under way in southern Afghanistan. After landing in a largely peaceful village, the Marines are trying to build positive ties with locals while seeking out enemy Taliban. July 6, 2009  U.S. Marines are setting up small outposts in the southern part of Afghanistan. 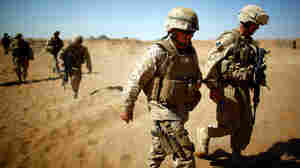 Some 4,000 Marines pushed into Helmand province last week in an effort to dislodge the Taliban and other Islamist insurgents who have had a grip on much of the region for years. July 4, 2009  The Marines of the 2nd Battalion, 8th Regiment — known as "America's Battalion" — are prepared for anything as they move into the southern village of Sorhodez in the Marine offensive to wrest Afghanistan's Helmand River valley from Taliban control. July 3, 2009  Marines with the 2nd Battalion, 8th Regiment, known as "America's Battalion," are part of the force that has launched a major assault in southern Afghanistan. On the night they went into battle, families at home heard the news — and began reaching out for information about loved ones. July 3, 2009  Thousands of U.S. Marines are digging in for a drawn-out campaign in southern Afghanistan aimed at ousting the Taliban. It's the largest operation launched by American troops since the fall of the Taliban government in 2001. The immediate goal is to drive out insurgents before next month's presidential elections. 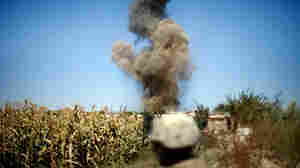 July 2, 2009  At least one Marine has been killed and several others injured as a predawn operation launched Thursday continued in Afghanistan's volatile Helmand province. 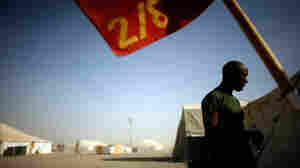 About 4,000 Marines are setting up positions in a river valley that has been Taliban stronghold. The operation is the first test of the Obama administration's new counter-insurgency strategy.